Gov. Gerard Brandon is the son of Gerard Chittocque Brandon and Dorothy Nugent. He was born, the second child and and first son, on Sep 15, 1788 in Adams County, Mississippi at Selma Plantation. On Jan 18, 1816 in Bardstown, Kentucky, he married Margaret Chambers, with whom he had a son, Gerard Chittocque Brandon. 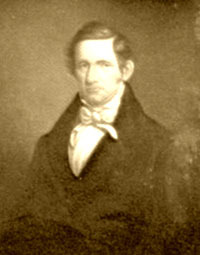 The couple settled in Adams County, Mississippi, where Gerard went on to become the state's 4th (1825–1826) and 6th (1826–1832) governor. He was the state's first native-born governor. Gerard and Margaret also had a son named James Chambers Brandon, M.D. (born Apr 16, 1820, died Nov 11, 1884) and was married to Anna Virginia Monette on Jan 10, 1861. In June of 1820, less than two months after their son James was born, Margaret - at the young age of 24 - died. ...was educated at Princeton University and William and Mary College. He practiced law at Washington, the Mississippi Territory capital, and was a successful planter in Adams County. Brandon, a veteran of the War of 1812, was a delegate to the constitutional conventions of 1817 and 1832 and helped draft the state's first two constitutions. He also served in the Mississippi Legislature and was elected Speaker of the House of Representatives in 1822. GERARD C. BRANDON, the fourth and sixth governor to serve Mississippi, was born on Selma Plantation, Natchez, Mississippi on September 15, 1788. His education was attained at Princeton University, and at William and Mary, where he earned a law degree. In 1815, he established a legal practice in Washington, Mississippi. Brandon first entered politics as a member of the 1817 Mississippi Constitutional Convention. He also served as speaker of the Mississippi House of Representatives in 1822, and was the lieutenant governor of Mississippi from 1822 to 1825. On November 17, 1825, Governor Walter Leake died in office, and Brandon, who was the lieutenant governor at the time, assumed the duties of the governorship. He served in this capacity until January 7, 1826, when newly elected David Holmes took office. After Governor David Holmes resigned from office on July 25, 1826, Brandon again assumed the governorship. During Brandon’s tenure, primary and secondary schools were established; a charter was secured for the state’s first railroad; the judicial system was improved; and whites began to settle in land previously occupied by the Choctaw Indians. Brandon left the governor’s office on January 9, 1832, and retired from political life. Governor Gerard C. Brandon passed away on March 28, 1850, and was buried in Columbia Springs, near Fort Adams, Mississippi. Governor Brandon died at his Columbian Springs Plantation in Wilkinson County, Mississippi, where both he and his two wives are buried. More on Gerard Brandon at The Munsons of Texas.